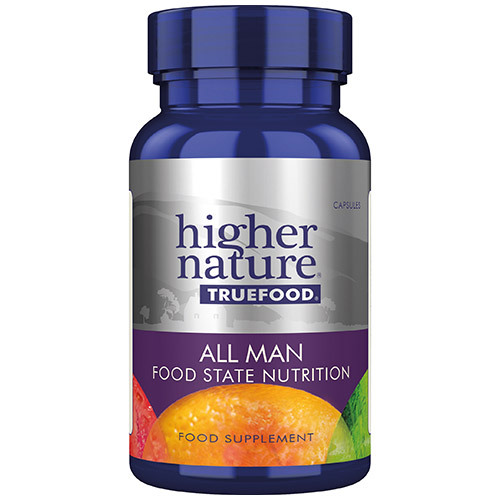 A complete multinutrient for men of all ages, True Food All Man provides a complete spectrum of bio-transformed vitamins and essential minerals. In addition, the formula provides key antioxidants, brain foods and amino acids, plus a wide spectrum of botanicals selected for men, and a hardy probiotic for digestive well-being. Unfortunately it`s a sad fact that most people do not get all the nutritional goodness they need from the food they eat. With modern `fast food`, no time to cook or design a diet rich in natural nutrients or just a desire to lead a healthy life, there`s always a good reason to ensure that your body gets what it needs to maintain health. True Food All Man does just this, loaded with vitamins, minerals, digestive aids and much more this multinutrient will ensure your body has the nutrients it needs to support and maintain proper health. Proprietary mixture: zinc sulphate, magnesium chloride, copper sulphate, ascorbic acid, boric acid, niacinamide, ferrous fumarate, calcium pantothenate, riboflavin, d-alpha tocopherol (wheat), manganese chloride, chromium chloride, pyridoxine HCl, thiamin HCl, whole soya, sodium molybdate, folic acid, biotin, phytonadione, cyanocobalamin, vitamin D2 with enzyme digested S.cerevisiae (with soya); selenium, co-enzyme Q10, beta carotene enriched, enzyme digested S.cerevisiae; lithothamnion calcarea, capsule: hydroxypropyl methylcellulose*; magnesium ascorbate, kelp, silicon dioxide, anti-caking agent: magnesium stearate*; carnitine, parsley, bromelain, vitamin A acetate* (stabilisers: acacia gum, sucrose; anti-caking agent: maize starch, tricalcium phosphate; antioxidant: dl-alpha tocopherol); fenugreek seed, garlic horsetail, artichoke, ginger, a-lipoic acid, brocolli extract, bacillus coagulans, capsicum fruit (carrier: potato maltodextrin). Adults take 1 to 3 capsules a day with or between meals, or as your health professional advises. Below are reviews of True Food All Man - 30 Vegicaps by bodykind customers. If you have tried this product we'd love to hear what you think so please leave a review. Question about True Food All Man - Multinutrient - 180 Vegicaps Are the True Food supplements suitable for those with an intolerance to yeast? Question about True Food All Man - Multinutrient - 180 Vegicaps Are the nutrients in the True Food range synthetic? 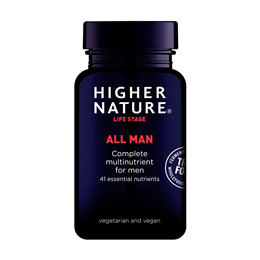 Question about Higher Nature True Food All Man - 90 Vegicaps Are the True Food supplements suitable for those with an intolerance to yeast? Question about Higher Nature True Food All Man - 90 Vegicaps Are the nutrients in the True Food range synthetic?